Note: I have this topic ghosted in the Public Gallery right now, but for future reference, its permanent home is a sticky in Tips And Tricks. One of the most common problems I’m seeing beginner colorists struggle with on the board these days is how to add depth and focus to a page or panel, and draw the eye to important elements. This is my attempt at starting a series that I can refer back to during crits, to try and illustrate points. I’ll very likely edit phrasing and add tips from time to time, so be sure to check back in a few weeks, as things will probably be ironed out a little. Part 1: breaking up Planes. 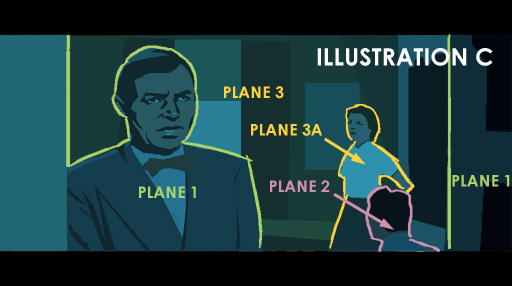 Illustration A is a screen grab of James Mason in “Bigger Than Life.” This movie is FANTASTIC reference. Shot after awesome shot. Great moody shadows, etc. Only available as a region 2 DVD for some reason though. The director (Nicholas Ray) and cinematographer (Joseph MacDonald) have done a great job of leading the eye around for the most part, although the dude below Barbara Rush gets lost in the shot. Illustration B shows where my eye is tracking while I look at the frame. B1 is a large flat area of high contrast, next to the biggest shapes on screen, and is on the left hand side (as we’re trained to read) so my eye *might* go there first. B1, B2 and Mason’s shirt create a pattern, so I’m drawn to the bow tie at the center of that pattern, and then up to his face. There are more reasons we look to his face, but I'll cover that in another section when I can get to it. B3 is the highest point of contrast in the image, and is likely the first place most people will look. B4 gets pretty lost here. The seated guy’s position is kind of awkward, but he’s not likely very important to the scene, so that can be a good thing. You would not want to go out of your way to draw attention to this guy if he was not relevant to what is going on. You just need to know he’s there if you look for him, to maintain continuity from scene to scene. Basically, while this works great as a movie frame, if this was a colored comic panel the existing color choices would not be great. All the colors have similar values, contrast, and hue. Mason’s suit ties into both the wall and the actress’ skirt. The seated man is essentially invisible, and his flesh tone makes it easy to mistake his face for Barbara Rush’s hand. The whole image looks very flat, and it’s hard to tell that the wall at B1 is not on the same plane as B2. The easiest way to deal with all of these problems as an illustration or comic panel is to break up all the planes distinctly. 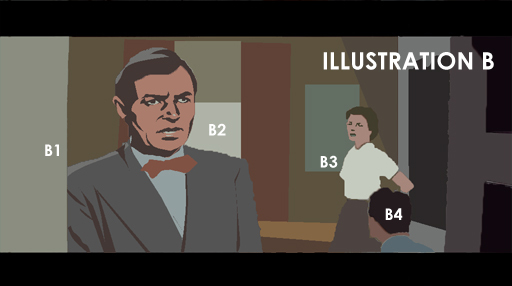 In Illustration C, I’ve indicated how I’d separate the important elements and depth of field. 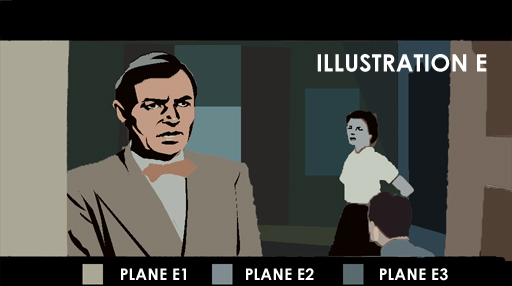 Plane 1 is extreme FG, Plane 2 is the seated guy, and Plane 3 the BG. Plane 3A is distinguished because even though it’s in the BG, that character has to pop forward a bit and have higher contrast. 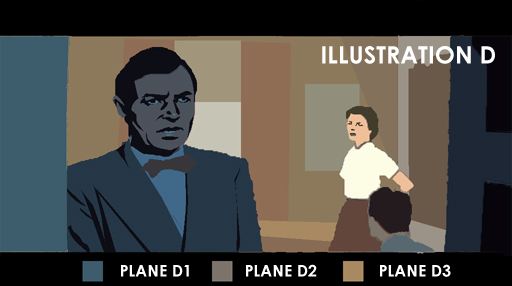 In Illustration D, I’ve used dark blues for Plane D1, earth tones for Plane D3, and a midway blend for plane D2. There are lots of ways to pop D2 if you need to, but we actually want that seated guy to be unnoticed.It's essential that he have his own plane though, because If he were part of plane D3, he’d tie into the woman, and if he was part of D1’s scheme, it would look like James Mason was talking to a midget. Note that I kept the high contrast shirt on the woman in the BG, but made her pop more by making her skin tone more saturated than the background. In Illustration E, I reversed the color combos, just so you could see that there are many ways to tackle the same problem, depending on who’s more important, the mood, the environment, etc. 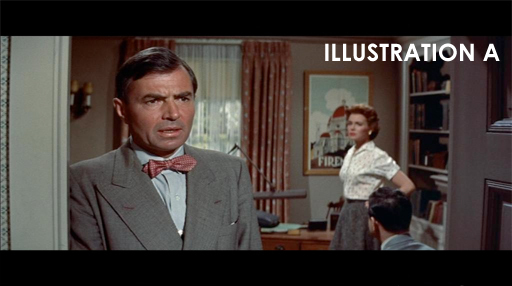 Emphasis is a little more focused on Barbara Rush in illustration D, and on Mason in Illustration E. Overall, focus is going to be more towards Rush no matter what due to the layout of the shot. I'm glad you posted this. Are you planning to post excerpts from that Disney book? Or do similar examples? There are so many artists in this field who would rather others remain ignorant, so that it may possibly benefit themselves in the offset. You Dave, and others here, actually have a drive to help and educate other beginners. It's quite amazing to me, and I can't thank you and the other pros on here enough for the generosity you show us who have come here for help and growth. fearlessfosdick wrote: I'm glad you posted this. Are you planning to post excerpts from that Disney book? Or do similar examples? I'm going to do a section with my own examples because I want to try to work in some extra stuff. Hey, it's a pleasure. The more people share knowledge, the better art becomes for everyone. I've definitely had this problem and I'm sure the other newbies have, also. Way to identify the problem. This is a huge help. Ooo amazing mini-tut, thank you Dave! it really puts straight into words things I am trying to figure out by trial and error, so this is a great help. Thanks. I dig it. It reminds me of when I was learning how to paint in grayscale and using old b&w cinema stills as reference. You basically have to train yourself to recognize what your mind is reading since the mind uses visual shortcuts all the time. This mini-tute is fantastic. This is exactly something I've been trying to spend alot more time focusing on and getting better at recently. Nice breakdown, Dave. It's interesting because there are so many ways to separate planes - hue, warmth, saturation, brightness, holds, and probably other things. May i use this post at my comunity of coloring (colorista de hq) (Translating to portuguese)?